The Nature Conservancy of Canada’s (NCC’s) Conservation Volunteers program engages Canadians of all ages. Volunteers can lend a hand in the protection of Canada’s species and natural habitats. Conservation Volunteers events provide meaningful, hands-on educational experience in some of our country’s most precious natural areas. From butterfly and bird counts, to beach sweeps and invasive species pulls, NCC’s Conservation Volunteers program offers a wide range of conservation-focused events. Since 2006, NCC’s Conservation Volunteers program has involved over 19,000 Canadians across 1,500 events. Last year, more than 2,800 volunteers helped NCC staff with over 200 projects on conservation sites across the country. NCC has benefitted greatly from volunteer involvement since 1962. 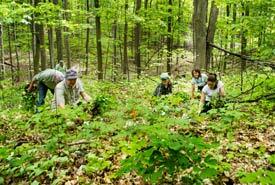 In 2001, NCC established a formal volunteer program in Ontario in partnership with Ontario Nature (then known as the Federation of Ontario Naturalists). Since then, thousands of volunteers have teamed up to help advance conservation work. In doing so, they have also developed valuable stewardship skills in some of Ontario's most beautiful natural landscapes. Both organizations continue to offer a variety of outdoor volunteer opportunities. The Conservation Volunteers program expanded into Alberta in 2006. Since then, it has grown to include events in all provinces.